Update SUN 21. April 2019 (vf): An eighth and ninth explosion have rocked Colombo, Sri Lanka's largest city and commercial capital, shortly after over 200 people were killed and as many as 400 were injured on Easter Sundayin six powerful blasts after 09h00 local time that hit in a coordinatd attack 3 hotels and 3 churches. Later 3 other devices exploded in different locations. The Sri Lankan Defense Ministry has imposed a nightly curfew. Seven people have been arrested and the social media have been cut off to control the people. The new law will allow the Ainu to observe and maintain traditional practices such as collecting wood from national forests and catching fish in rivers, using time-honored, traditional methods. The Japanese government approved legislation to legally recognize and preserve the cultural practices of the country’s Ainu Indigenous people at an Upper House plenary session Friday. The legislation, according to Kyodo news agency, aims to preserve the culture of the Ainu people through state-backed financial assistance at central and local levels of government as well as promote the group’s culture and heritage. Head of the Ainu Association of Hokkaido, Tadashi Kato, pointed out that the new law did not cover ways to improve the living standards of the Ainu people. 682 protesters have been arrested over 5 days in London. Over 100 protesters were arrested Friday in London, as part of the ‘extinction rebellion’ days of action that seeks to draw attention to climate change. Friday represented day five of the group’s direct action protests. The 100 people arrested brings the total number to 682 detained this week. This action had protesters planting a makeshift boat in the middle of Oxford Circus, London’s busiest shopping strip. The boat was named the ‘Berta Caceres’ boat, in honor of the Honduran environmental activist who was murdered for her activism against extractive companies. Profit-seeking intruders have had negative effects on Wampi territory, through deforestation and water pollution, as a result of gold mining. The Wampi Nation of Peru, the first-ever Indigenous autonomous group in the country, continues to fight back against illegal deforestation and raise awareness of land issues in the country, and subsequently the rest of the world. The Wampis have managed to expel illegal miners from their land both directly and through notifying the national authorities. While illegal logging proves more difficult to curb, Wampi soldiers serving in battalions along the Ecuador-Peru border work with government authorities and Wampi leaders to expel intruders from the region. In addition to mining and logging, the oil industry proves to be the biggest threat to the Wampi Nation. The Oleoducto Norperuano oil pipeline was built through the territory and has a history of spills and leaks, including 23 between 2001 and 2016. Many demand: Yankees Out of Africa ! 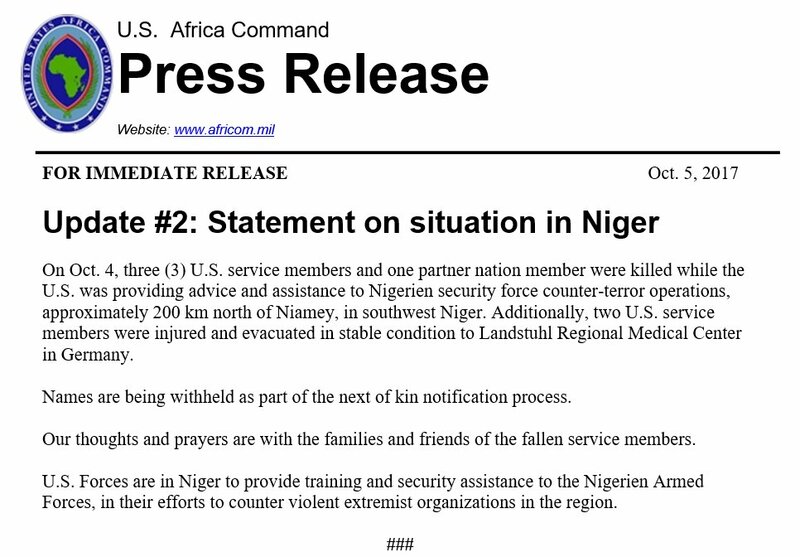 Many Americans first became aware of U.S.military operations in Africa only in October 2017, after the Islamic State ambushed American troops near Tongo Tongo, Niger, killing four U.S. soldiers and wounding two others. In situations of war, collective violence or atrocity there is no such thing as a neutral stance. Passive by-standing is aiding and abetting evil. Don’t be complicit. LISTEN WHILE READING: They Don't Care About Us ! Guri Dam the electicity generating core of Venzuela's power grid. Update MON 15. April 2019 (vf): Russia will provide strategic cooperation to the Venezuelan government to investigate several attacks against the National Energy Service (SEN) said Russian Deputy Foreign Minister Oleg Syromoloto Monday. The Russian deputy foreign minister said Russia will help Venezuela in investigating the cyber attacks on the country which cause nation-wide blackouts. "Russia is providing the Venezuelan friends with all the necessary cooperation in response to the requests of the government of President Nicolas Maduro," said Syromolotov. He reiterated that support for investigations will be given because the Venezuelan government has constantly said the attacks in March were cyber aggression against the SEN of the country. Meanwhile, the Russian diplomat mentioned that the perpetrators of the attack against the SEN knew the vulnerabilities of the system. "Of course the masterminds of the attack knew well the operative algorithms, the vulnerabilities of the equipment and the corresponding systems," he said. Ouham river destroyed by Chinese mining activities. Virunga National Park is home to the critically endangered mountain gorilla. Photo by Fanny Schertzer via Wikimedia Commons (CC BY 3.0). The attack, the deadliest in the park’s history, brings to 175 the toll of Virunga rangers who have been killed while guarding the park to date. Virunga, Africa’s oldest national park and a UNESCO World Heritage Site, is home to rare mountain gorillas, but continues to be plagued by the long-running armed conflict wracking the eastern DRC. Suspected members of an armed militia ambushed and killed five rangers and a driver in Virunga National Park in the Democratic Republic of Congo on Monday, park authorities said, in the deadliest attack yet at what is already one of the most dangerous conservation sites in the world. The Mau Forest complex in Kenya is the core of the ancestral homeland of the aboriginal Ogiek people, who suffered since colonial times at the hands of outsiders trying to grab their forest ressources including the water sources of the Mau. Despite a legal ruling and international attention, Kenya's Ogiek people have continued to face evictions, underlining the inherent difficulties in implementing judgments. Post-colonial states have been unable to address such issues since formal law has continued to prevail over ancient customary systems even post-independence. One such example is the Ogiek in Kenya’s Mau Forest, whose fate is to be determined by a Task Force whose report is due at the end of April. The Task Force report should be significant not only for the Ogiek, but for indigenous peoples in Kenya and Africa, with wider global repercussions. The Ogiek have lived in the Mau Forest for centuries. Their struggle through courts to gain recognition of their ancestral domain through formal law has been a long one. As trees grow they remove carbon from the atmosphere. New forests can therefore play an important role in meeting the goal of keeping Earth’s temperature to 1.5℃ above pre-industrial levels. Governments and wider civil society are increasingly recognising these benefits. One important step was the 2011 launch of the Bonn Challenge to restore 350m hectares of forest by 2030. This is a major undertaking – the area is a little larger than the size of India. Spurred by the necessities of drastically cutting emissions and removing carbon dioxide from the atmosphere to meet climate targets, many countries, including Brazil, India and China, have committed large areas to forest restoration. Adding up the Bonn Challenge and other national pledges from 43 countries across the tropics and sub-tropics – where trees grow fast – reveals that these governments have pledged to restore 292m hectares of degraded lands. This very welcome news is, unfortunately, not all that is seems. Our new analysis, published in Nature, shows that implementing the current pledges under the Bonn Challenge will mean the 1.5℃ climate goal is still missed.